Fitzroy Town Hall will again play host to the Rock-A-Bye Baby Music Sessions presented by community radio station PBS FM. Now in its sixth year, the 2015 season kicks off on Thursday 12th February with a New Orleans-style Mardi Gras party! Melbourne brass band Horns of Leroy will be bringing their raucous live tunes to this daytime gig where the music isn’t dumbed-down and caters to the enjoyment of all ages. Expect lots of noise, fun and of course dancing. 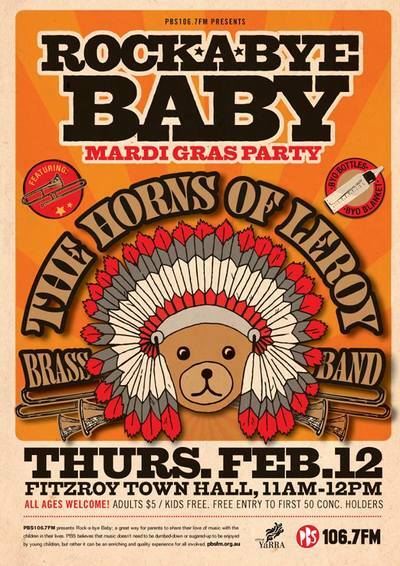 Bring your beads and your babies to this one hour show starting at 11am. Entry is $5 for adults, kids are free and the first 50 concession card holders through the doors will also receive free entry. Please note: these shows can be quite loud so ear protection for your little ones is recommended. OH NO.....We've missed this by.nearly..17 months! Same I didn't notice it LAST YEAR! !